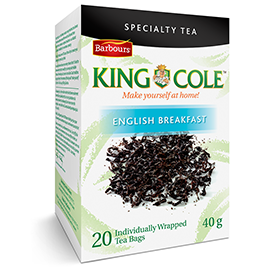 Our traditional blend of black tea uses only the finest tea leaves from tea estates around the world. 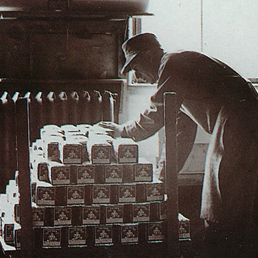 Warming up with King Cole Tea has been an Atlantic Canadian tradition for more than a century. King Cole Orange Pekoe is a quality tea blend made with full-sized premium tea leaves. It’s a consistent, quality cup of tea every time. Available in 20, 30, 60, 120, and 240 tea bags. 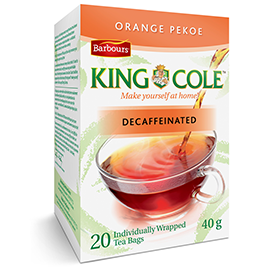 If you prefer a great tasting cup of tea without the caffeine, try our King Cole Decaffeinated Tea. 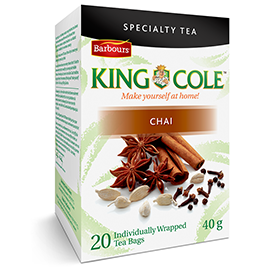 Enjoy an exceptional cup of tea with the same health benefits as our regular varieties, without caffeine. Available in: 20, 30, and 120 tea bags. 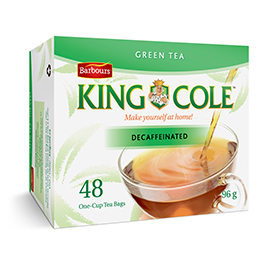 This smooth, lighter-tasting tea is a perfect start to the day, and a great choice for those who like to add a little milk & sugar. Using the unfermented leaves of the Camellia Sinensis plant (the same plant used for black tea), green tea contains comparable caffeine but more health benefits – by lowering cholesterol, improving attention and concentration, and boosting metabolism. 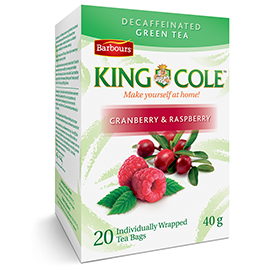 King Cole green teas are growing in popularity with Canadian tea drinkers. The unfermented leaves of the Camellia Sinensis plant creates a delicious green tea that helps boost metabolism and contains healthy anti-oxidants. Drinking tea is a natural and pleasant way to boost your physical and mental health. If you're looking for a new twist to your tea, why not try one of our flavoured teas. 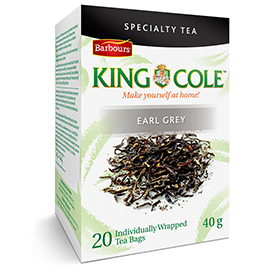 Enjoy the same great King Cole taste with a fresh flavour. There's one for every mood and season. We've combined our traditional black tea with all-natural Bergamot flavour to create a smooth-tasting Earl Grey blend. We're spicing up our traditional black tea with Barbour's spices to make a unique blend of Masala Chai tea. Mmm Winter. 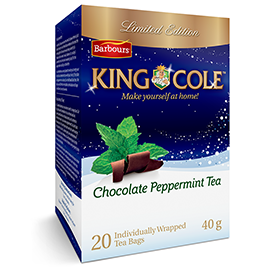 We've combined our traditional black tea with natural Chocolate and Peppermint flavours to create a heart-warming winter tea. Ahh summer. 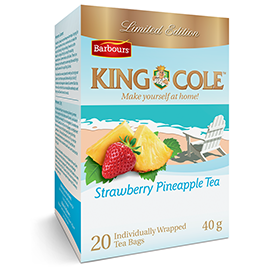 We've combined our traditional black tea with natural Strawberry Pineapple flavours to make the ultimate summer tea. Try it chilled on a hot day. 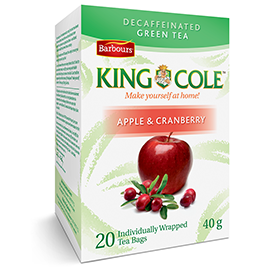 We've combined our green tea with natural Apple and Cranberry flavours to create a fresh-tasting decaffeinated green tea. Try it chilled for a perfect summer iced tea. Our Tea Taster has blended our green tea with natural Cranberry and Raspberry flavours to create a unique decaffeinated green tea. Try it chilled for a perfect glass of iced tea. 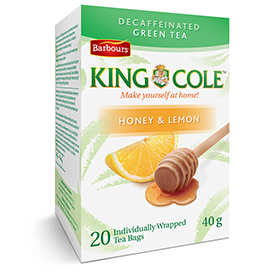 A soothing blend of Honey and Lemon in a smooth decaffeinated green tea. Perfect when you’re feeling a little under the weather and need a little TLC. 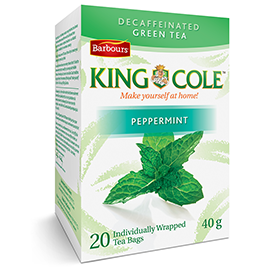 We've combined our green tea with natural Peppermint flavours to create a refreshing decaffeinated green tea. Our organic teas meet the same great taste expectation you find from all King Cole tea, plus their ingredients meet the rigorous national and global standards for organic production. These great tasting tea blends feature no preservatives, synthetic additives, artificial flavors or chemical dyes. A New York tea merchant sends samples of tea to his customers in small silk pouches. They mistakenly assume the bags are to replace their metal infusers.